As someone who enjoys seeking out the best of local and seasonal foods, I was interested to learn more about true, indigenous, North American ingredients and recipes made with them. In The Sioux Chef's Indigenous Kitchen by Sean Sherman, everything used would have been available to Native Americans. I recently received a review copy of the book. There are no European-introduced foods like wheat flour, dairy, sugar, or domestic pork or beef. Many of the ingredients used here could be foraged, but there are also suggestions for store-bought versions and substitutions for harder to find items. And, modern conveniences like food processors and other appliances are perfectly welcome in creating these dishes. Still, these recipes result in dishes that are true to the indigenous way of eating which just happens to be low-glycemic, high-protein, low salt, often plant-based, dairy-free, refined sugar-free, and gluten-free. Before reading this book, it hadn’t occurred to me that Native Americans used duck and quail eggs rather than chicken eggs, and that’s what’s used here. Although, large chicken eggs can be substituted for duck. There’s a recipe for Deviled Duck Eggs made with smoked salt and ground sumac and another for Old-Fashioned Cornmeal Mush with Poached (Duck) Eggs that look divine. The three sisters ingredients, corn, beans, and squash, figure prominently and in interesting ways. There’s Stuffed Squash Blossoms dredged in masa, Hominy Cakes served with Smoked Duck, and Hearty Mushroom Sweet Potato and Bean Soup. The proteins include fresh water fish and game like grouse, pheasant, rabbit, venison, and elk. And, there are several sweet treats made with maple syrup, maple sugar, and honey. I can’t wait to try the Maple Squash Sorbet with Cranberry Sauce in which roasted squash is pureed with maple syrup and cider before being churned into sorbet. First though, as a long-time fan of wild rice, I couldn’t pass up the versatile Wild Rice Cakes. They could have been served as a dessert with maple syrup and berries, but I went the savory route with a topping of Smoked Whitefish and Bean Spread. To make the wild rice cakes, you first need cooked wild rice. I sometimes have some in my freezer, but not this time. I cooked enough to use for this recipe and to freeze a bit for another day. 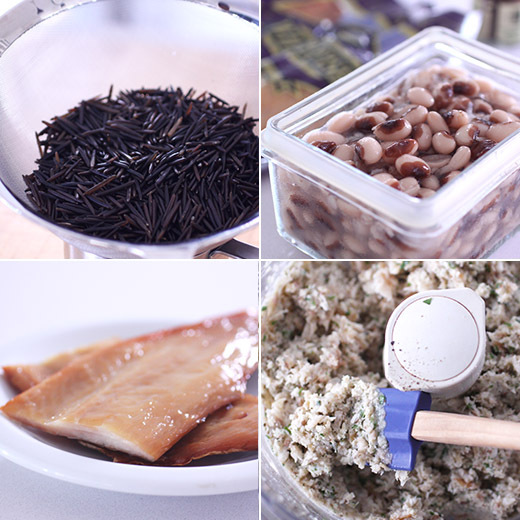 The cooked wild rice is re-cooked until very soft, and then it’s drained and pureed in a food processor. The resulting dough is then mixed with salt and some cooked wild rice that was reserved before pureeing before being shaped into patties and fried on each side until browned. For the Smoked Whitefish spread, you need some cooked beans, and in this case my freezer came through for me. I had stored away some yellow-eye beans that worked well here but just about any type of bean would be fine. Smoked white fish was prepped by removing the skin and flaking the fish. I started by pureeing the beans in the food processor since they should be made smooth, then I pulsed the fish with some salt, oil, and ground sumac. I wanted the fish to retain some texture. 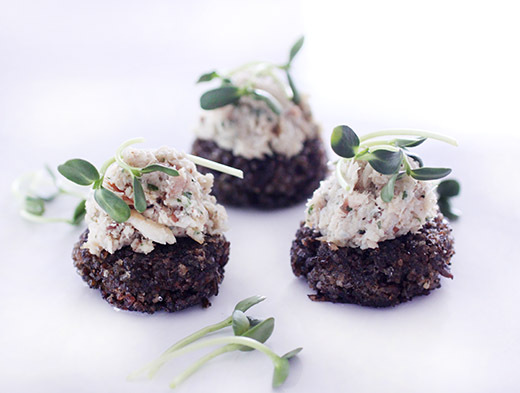 The fish and bean spread was spooned onto the crispy wild rice cakes and topped with some sunflower sprouts. The whole grains of rice added to the pureed dough before making the cakes gave them great texture. They were crispy-edged and chewy in the middle. And, they made fantastic vehicles for the smoked whitefish spread. As with all the recipes in this book, straightforward and nutritious ingredients became a flavorful dish that could be served as elegantly or as simply as you wish. These very traditional foods are presented in a way that’s perfectly-suited to the here and now. Recipe reprinted from The Sioux Chef's Indigenous Kitchen by Sean Sherman with Beth Dooley (University of Minnesota Press, 2017) Copyright 2017 Ghost Dancer, LLC. All rights reserved. Used by permission of the University of Minnesota Press. These are our go-to cakes for breakfast, as a snack, and as the base for a well-seasoned bison braise or duck. They’re especially good topped with smoked fish and our bright lemony Sorrel Sauce. Make them tiny for an appetizer or big for dessert slathered in maple-berry sauce. The recipe for these couldn’t be simpler. It’s just overcooked wild rice, pureed into a thick dough. We like to stir in a little cooked wild rice for texture. Once shaped, these will keep several days in the refrigerator, so feel free to make them ahead. Leftovers may be re-crisped in a low oven until warmed through. Put 1 1/2 cups cooked wild rice and water into a saucepan, reserving 1/2 cup. Place over high heat, bring to a boil, and reduce the heat to a simmer. Cook until the rice is very soft and the water has evaporated. Drain. In a food processor fitted with a steel blade, puree the rice into a sticky dough. Place the dough into a medium bowl and work in the salt, sugar, and the remaining cooked rice. Scoop out a scant 1/4 cup dough for each patty and shape to rounds about 1/2 inch thick. Heat the oil in a heavy skillet and brown the patties about 5 to 8 minutes per side until lightly browned. Transfer the patties to a baking sheet and place in a warm oven until ready to serve. This creamy spread is great with our Amaranth Crackers, or piled high on Corn Cakes, or Wild Rice Cakes. This is the filling for Stuffed Squash Blossoms. 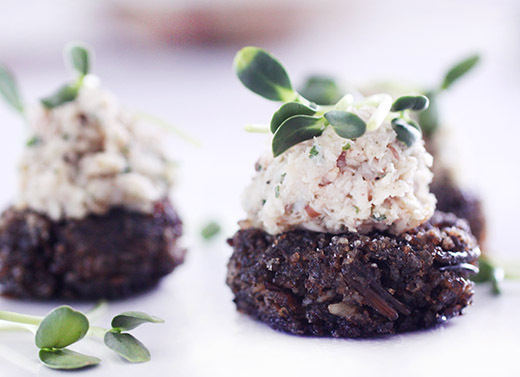 Love the idea of wild rice cakes! Wild rice has such terrific flavor, these cakes must taste wonderful. Neat recipe -- thanks. Have never thought of using wild rice this way...love how they turned out...earthy and packed full of flavours, Lisa. i don't eat a lot of rice, but i still think i would've seen it processed and formed into a cake at some point in my life...this is a first! This cookbook sounds really fascinating and interesting to me. These rice cakes look so elegant.